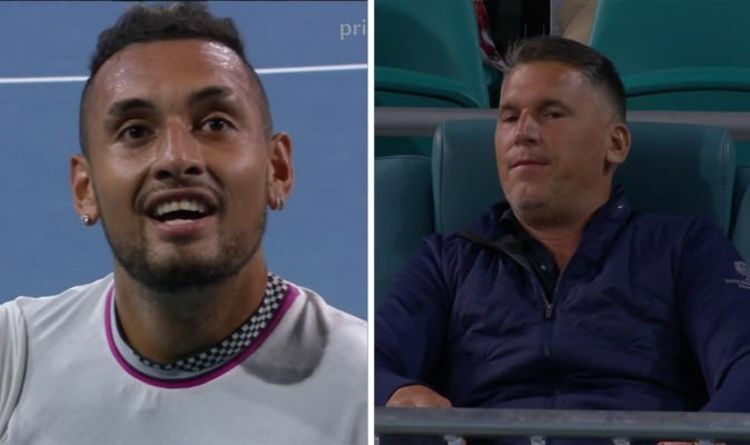 After being caught by cameras shouting, “F***ing first serve” early in the first set, Kyrgios was later involved in a heated exchange with one seated supporter. Shortly after going 4-1 up via an underarm ace, Kyrgios was shown approaching the front of the stands. The Australian soon received a code violation for delaying the game shortly after Lajovic’s long serve put him 40-15 up in the sixth game. He threw a tennis ball up into the stands towards the fan, much to the delight of the Miami crowd who all loudly cheered. Kyrgios sarcastically clapped the fan, as those in the stands filmed the bizarre scenes with their phones. But the fan was soon escorted away from his seat to the delight of Kyrgios and everyone else in the arena. Amazon Prime’s lead match commentator said: “Clearly the guy in the crowd has said something. “Possibly not appreciating the underarm serve or something in the last game. Nick, as he does, has reacted. “This guy is not letting it go right now. This is all getting a bit pathetic now. He should really be escorted out. “The umpire needs to get hold of this. I’m not excusing the behaviour of the fan, who’s clearly rattled him with some trash talk or whatever he’s said at the back of the court. And he soon revealed what the fan apparently said to Kyrgios during the mid-match altercation. Kyrgios won the extraordinary match 6-3, 6-1 in just 57 minutes. Despite the drama, the 23-year-old produced a supremely entertaining performance to progress and progress to the fourth round.